The Tower of Pisa isn’t the only world monument that leans. 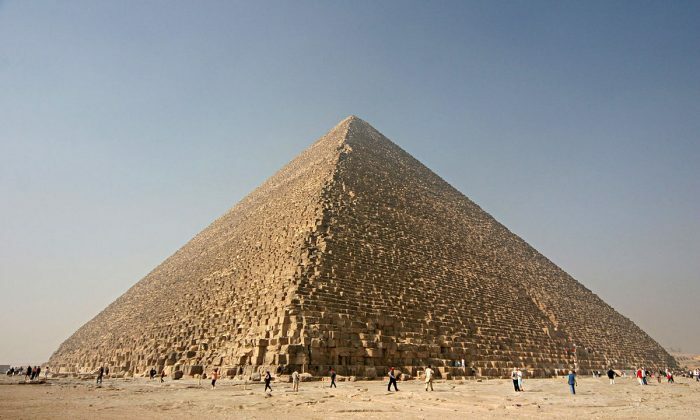 The west side of the Great Pyramid of Giza—and one of the Seven Wonders of the Ancient World—is longer than its east side by about 14.1 centimeters, or 5.6 inches. This means the pyramid is not quite square—but it’s still quite precise relative to when it was built, according to Glen Dash, an engineer who was part of a team who discovered the anomaly. The small defect makes the structure lean ever so slightly to one side. The Great Pyramid, constructed some 4,500 years ago and standing 445 feet tall, was originally covered in limestone casing, but that is mostly gone, leaving the structure the way it is today. Dash and his team took the measurements to see what the pyramid was like before it was stripped. The deviation between the west side and east side had not been detected until now. Dash said the survey of the pyramid was an effort “to try to figure out just how technically sophisticated the Egyptians were, because the ancient civilization did not leave us much evidence of their technical skill in their writings. The Egyptians, he noted, used wood, rope, stone, and copper with “extraordinary cleverness and skill” to achieve what they did. “Today, if we have a technical problem, we build a new machine. The Egyptians, as far as we can tell, just used what they had at hand in ever more ingenious ways,” Dash added.